This is an area I struggle with quite a lot and I am constantly revising and changing our space. 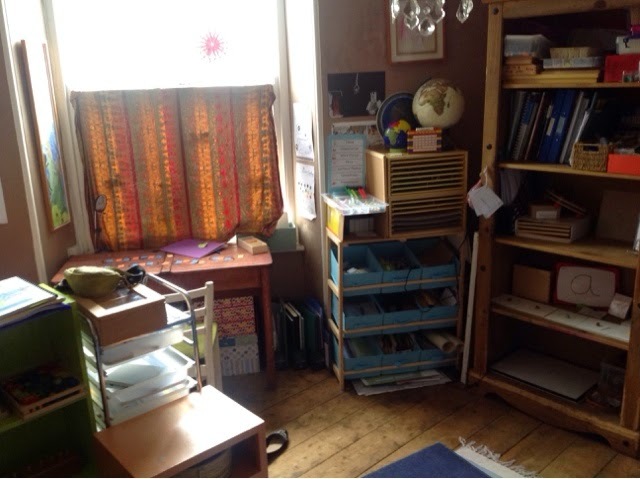 The fact is we don't have a big space and I am teaching two kids in totally different stages, meaning that we have quite a lot of stuff. At the moment we have taken over the living room. I mean it, totally taken over! We no longer have a living room, we have a sofa in a schoolroom. In the past we have used the kitchen (too many distractions), and a tiny little room which only fit one person in (obvious issues there). The living room is working well in that we can all be together with easier access to the things we need to use. I discovered that I can't get far enough away to take a picture of the whole room, so here I am just outside the door! On the right outside the door is our entry and you can see our coats and bags hanging up there. Inside the room is the sofa on the left (with dog head just visible! ), the green shelves and orange cupboard have rogues things on, the clear draws are for binx's work (she uses the workbox system), and just in the shot you can see the back of a white chair which is where her desk is. Over in the corner is the printer, and a cupboard where we keep office supplies, pens, paper, laminator and other things like that. The paper plates hanging up are a craft binx did when she was looking at the layers of the atmosphere. This picture is taken from the other end of the sofa. 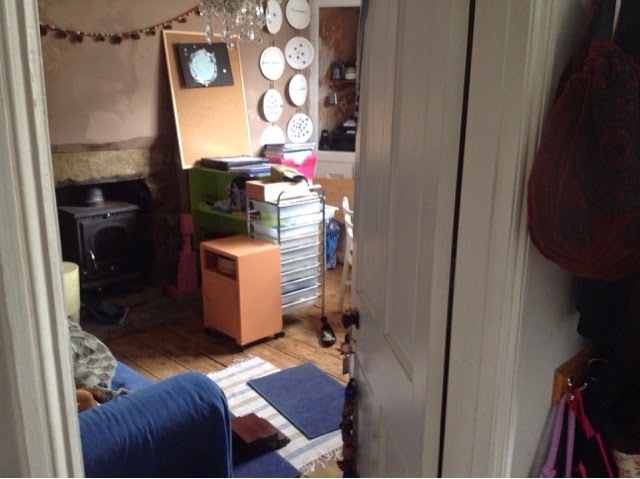 You can just see that green shelf and orange cupboard in front of me, and you can also see how mini the room is! The shelving unit on the right goes: top shelf - mostly maths equipment that binx uses occasionally and rogue won't need for a long time, second shelf - my notes, folders of ideas, some curriculum that binx uses and a box of spare glue, tape, pencils etc, third shelf - some botany puzzles and cards and a bird puzzle, fourth shelf - for rogue, language things, insets and a few sandpaper letters, fifth shelf - light pad and manipulatives. I will go into more detail as to what is on the shelves soon but for now I wanted to give a general overview. My main concerns are that it is crowded, not much floor space, and that the fire is so near to rogues shelves. The last time I rearranged this room was in the late spring so it wasn't an issue but as we get closer to winter it will be a problem that needs to be addressed. Before I have a complete rearrange though I'm going to wait for my course to start, see what advice I can get there and also wait and see if I get any responses here.